Our in-house florist has over 9 years worth of experience where she has undertaken commissions for corporate clients, weddings and special events. Her creations include weekly arrangements for reception or waiting areas, table arrangements, decorative flowers for your function hall or chapel, personal bouquets, buttonholes and corsages. Pop the Champagne doesnt offer off the shelf packages, we have realised that the emotion, imagination and creativity our florist brings to every arrangement ensures that every client receives an individual package tailored to them. Photo booths have become a popular way of not only entertaining your guests but of capturing those very important memories. Why hire a DJ when you can be the entertainment for the evening? 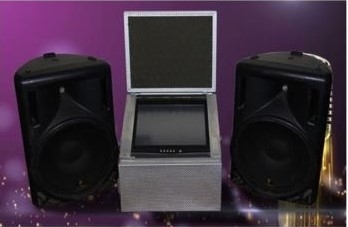 Jukebox hire is cost-effective and really gets everyone involved in the fun of the event. Monday to Sunday hire: R1,500.00 per day/night (plus refundable deposit of R1,500.00*). New Years Hire: R2,300.00 (plus refundable deposit of R1,500.00*). *The refundable deposit secures your booking, the remaining fee is payable on delivery. Within 7 days of return/collection the refundable deposit will be refunded. All necessary cables and adapters. Microphone with cord  R150.00 extra. Personalised candles make the perfect gift for any event: be it that special someones birthday, wedding party favours or just as a thank you for those special clients. If you can print it on paper, Pop the Champagne can custom print any artwork you supply onto your very own candle. If you are stuck for ideas on what to print we will assist you in preparing artwork at a minimal fee. There are no minimum quantities but we are sure once you have one custom candle you will NEED more.